Canaries have been raised in Germany for centuries and those coming from colder climate areas have grown to tolerate the cold quite well. 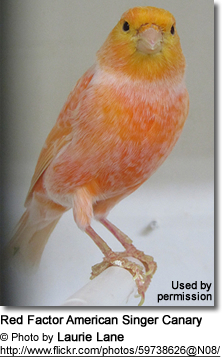 However, when acquiring canaries, it is very important to find out the environmental conditions they were kept in. They should be slowly acclimatized to lower - or higher temperatures - over a period of time. One should also keep in mind that newly acquired birds are going through the stress of moving to a new home. Their immune system will be compromised for some time and special care needs to be taken to protect them from draft and cold. New birds need to be quarantined from the existing birds for at least a month to protect both the existing breeding stock from an introduced disease, and to give the new canary time to recover and build up its immune system, which will be lowered initially due to the stress of being placed into a new environment. Before the breeding season, it's a good idea to trim the hen's vent area cleanly (to increase the chance of fertilization. Also trim the nails since long nails tend to get caught in the nesting material as they leave the nest. When that happens, they often end up pulling the nesting material - and any eggs or chicks on or in it - out of the nest. If kept in an aviary environment, they should be protected from draft and rain, of course. Covered aviaries are preferable - as they protect your canaries from the droppings of any wild birds perching on your aviary. Bird droppings can be infected with parasites, or bacteria and viruses. Additionally, wild birds often carry mites. You really don't want to introduce any of that in your aviary. The male and female birds are placed in the breeding cage in the breeding season, which tends to begin in the second half of March. Soon the hen begins to build a nest. In most cases, they will breed in open cup nests - sometimes even carrying nesting material to their food dish, if she decides that this is a good place to raise a family. Cup nests are commercially available, but they tend to be quite flimsy, hang down to a point where the eggs or chicks might fall out, or might fall down altogether. 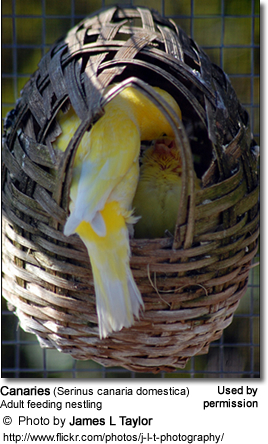 If you find a good, sturdy cup nest - that is the way to go for most canaries. However, some may accept a closed nest - in the absence of a suitable open cup nest. This is preferable, as eggs or chicks are less likely to fall out. At the onset of the breeding season, the male starts courting the hen. If she is ready and willing, she crouches down and they mate. In a day, seldom two-day intervals, the hen lays four to five blue-green, brown speckled eggs. 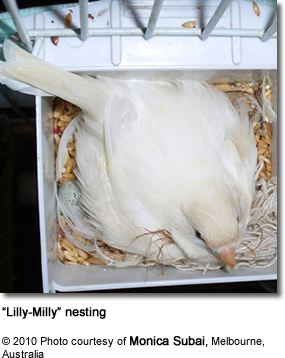 After 13 to 14 days of incubating, with the hen sitting on the nest, the tiny little canaries hatch out. For the first few days, regular (scalded) milk mixed with Hi-Protein baby cereal in a soupy consistency works well. After about 4 days, egg food can be provided (the youngest of birds can't tolerate egg yolk very well). After those initial few days, you can provide egg-food to your birds, in addition to the normal seeds. You can mix your own nestling food using hard-boiled eggs, mashed - including its shell (for extra calcium) - mixing it with soaked whole wheat bread and maybe with grated carrots. Nesting food is available at the store, which can also be mixed with egg. To four cups of dry nestling food, add one pound grated carrots, and one dozen grated hard boiled eggs. Chop the eggs in a food processor shells and all. This is for about fifty feeding hens. Boil the eggs for twelve to fourteen minutes to ensure that no fowl diseases are transmitted to the canaries. This mixture is given in an amount that the birds will eat in one hour. All birds get one treat cup per day of this egg mix. The supply for birds with feeding young is constantly renewed during the day. The nestling food with egg spoils very rapidly, particularly during the summer. It would be best to prepare the egg mix fresh every day. If this is not possible, refrigerate any excess immediately. NOTE: The feeding of eggs is best limited to the breeding season since overfeeding can result in health problems. Stop feeding egg food once the chicks are able to crack shells. 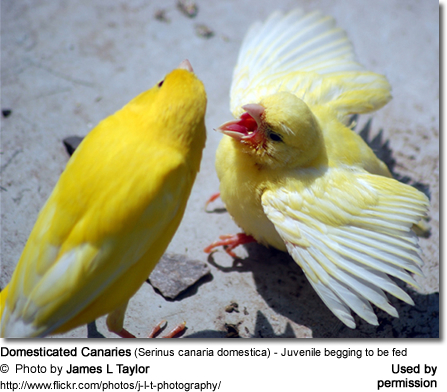 Canaries are usually good parents and both parents take care of the chicks, which they feed for about four weeks. At an age of about 21 days, the young canary birds leave the nest, start clumsily to move around in the cage, but proceed in coordinating their movements and start to feed themselves on egg food and seeds. The nestlings will excrete over the edge of the nest and the nest is likely to get soiled (particularly along the rim of the nest). In order to keep the chicks in a sanitary environment (and one that is free of mites), it may be necessary to exchange the dirty nest for a clean one. In order to minimize stress on the parents, have it all ready - to expedite the exchange of the nests. As soon as they are fully weaned, the young canaries should be separated from their parents. In adults, this is most commonly caused by overcrowding. Increase the available space per bird. Occasionally, a canary will start plucking their chicks. Sometimes they do it after the chicks have fledged (or are close to fledging) and they are eager to get started on a new clutch. If there is no suitable nesting material available, they may go after the chicks to get their soft down feathers. Provide suitable nesting material and see if they will accept that instead. If they don't, you will need to take action, or else the other canaries will often adopt this same behavior. This behavior can spread throughout the aviary. Keep an eye on the canaries and see who is doing it, and take that canary out of the breeding cage / flight. Keep as pet or place into the flight with the retired / non-breeding birds. If the canaries pull the down of their youngest chicks (not for the purpose of getting nesting material - but in a more abusive fashion), they may have to be removed from the breeding program straight away. 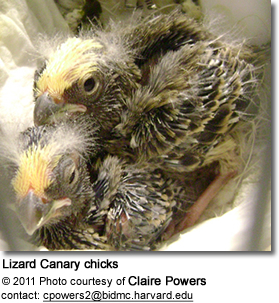 The Youngest Chicks Don't Thrive or Die: Female canaries lay one egg each day until she has laid all her eggs. The eggs will, therefore, hatch one day apart. The chances for the smallest chicks are diminished, as the larger chicks are stronger and more demanding and will, therefore, receive more food than the younger chicks. This may result in stunted growth and, in some cases, even death. 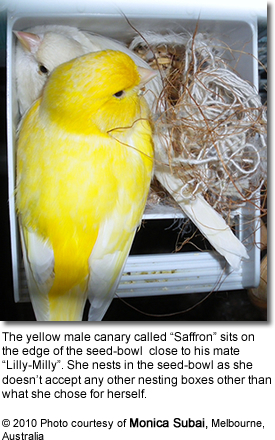 James Anagnos, an experienced canary breeder, suggests the following: "[T]he day she lays her first egg take it from her and store in safe place in a cup with some tissue or cotton. [Please refer to this webpage about properly storing eggs BEFORE incubation]. Take all her eggs every day as soon as she has laid them. When she has laid all [or her last] eggs, place them all back in her nest. She will now incubate all the eggs at the same time, so all the eggs hatch at about the same time. This will give all birds an equal chance. They are all the same size and strong. This will greatly reduce the chance of losing the younger chicks." Experienced breeders can often identify the gender of adult birds. Other than the obvious - their song - there are some changes in the vent area that can be good indicators. There are physical changes in breeding birds, such as more rounded abdomens in hens; and larger bellies in the males that protrude downward in the same direction as the legs. 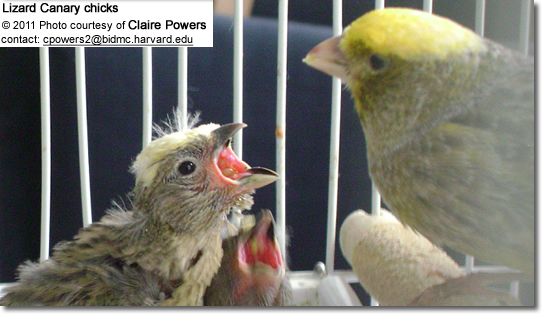 Crested Canaries (Top Knots) should always be mated to Uncrested Canaries (Plainheads). The gene that causes the crested mutation is dominant, but a double dose is lethal. When one gene is inherited, the bird is crested. If two genes are inherited, then the bird's skull is deformed and the chick usually dies in shell. From the results below it can be seen that you will not get any more live crested chicks by breeding crested to crested, therefore this is not recommended. Crested canaries will have a bald spot at the base of the skull. The goal is to reduce the size of this bald spot and to develop the length of the head feathers to conceal the bald spot. frosted feathers (frosted or non-intensive feathers will have white tipping as the lipochrome pigment stops just short of the margin of the web of the feather giving the canary a lightly frosted appearance.) 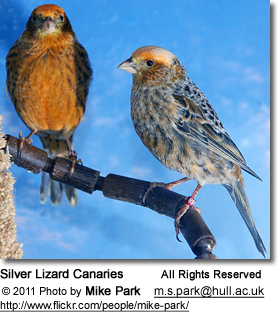 Please refer to the photo above of an "intensive-colored bird" (to the left) and a canary with "frosted feathers" (to the right). Also the red factor American Singer Canary to the right has "frosted feathers." 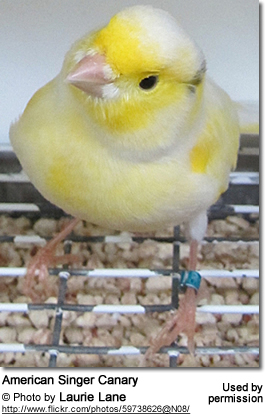 White Canaries are produced when the offspring receives both a yellow-producing gene and dominant white gene. Two albinos bred together will produce 25% offspring with a legal gene (will die in the egg or shortly after hatching). This is not a recommended pairing. Pairing two Buffs together can result in excess feathers and a condition called feather lumps. This is another pairing that is not recommended. The feather types are Yellow (non-frosted or intense) and Buff (frosted) - referred to as "Double Buffing"
Frosted feathers have white tips (hence the term "frosted"). 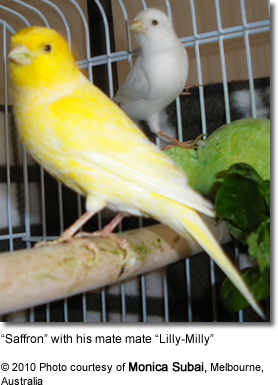 It is NOT recommended to pair two "frosted canaries," as this may result in softer feathers and feather lumps. Pairing a frosted with a yellow canary will strengthen the quality of the feathers.